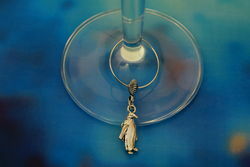 Make your wine glass stand out at your next party with the help of our Awesome Aussie Wildlife Wine Glass Charms. This Little Penguin may be small, but he knows how to make a big impact so you're sure to never lose your wine at your next party or bbq. 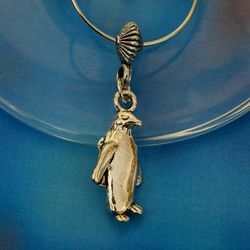 This Little Penguin Wine Glass Charm is a great gift idea for friends or family here and overseas. The charm is 11mm L x 3mm W x 14mm H. This Little Penguin is made from Tibetan silver and made into this beautiful wine glass charm here in Australia. Little Penuins are sea birds who cannot fly, but with flippers for wings these LIttle Penguins fly through the waters of the ocean. The Little Penguin is the only penguin found in Australia and are only found in the southern regions. These Little Penguins live up to their name of Little Penguin, they're only 33cm tall and weigh in at 1 kilogram.